Remember being a kid. Maybe you liked chocolate bars. Perhaps it was gum drops. Think back to when you first discovered that you could have so much of it that it stopped tasting great. Did you keep going? Did you have so much that you got a stomach ache? Did you get sick? For me, watching Doctor Mordrid was a lot like that. Similar to Darkman , it’s best thought of as a comic book movie that didn’t happen to be based on a comic. Rather, it’s inspired by several sources (largely Doctor Strange and, I believe, Heavy Metal ) melded together into a rich stew of prime cuts with cheese sauce. The film is packed with implied back-story and glimpses of other worlds and a cosmology that’s only hinted at and fighting skeletons and — it’s all a bit filling. It’s as though the filmmakers knew they’d only get the one chance so they threw in as much as they could. After watching it I felt happy but also worn out. Mordrid monitors world events from his luxury apartment. I’ll attempt a brief description of the set up. 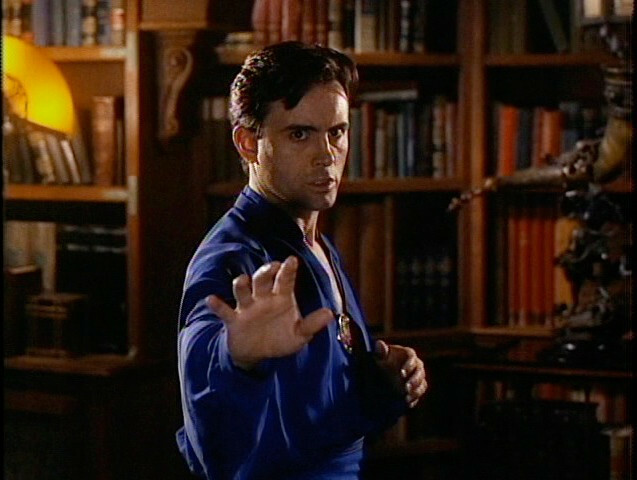 Dr. Anton Mordrid (Jeffrey Combs) is an alchemist from another world/dimension, who is charged by the bodiless Monitor with protecting the Earth from demons. 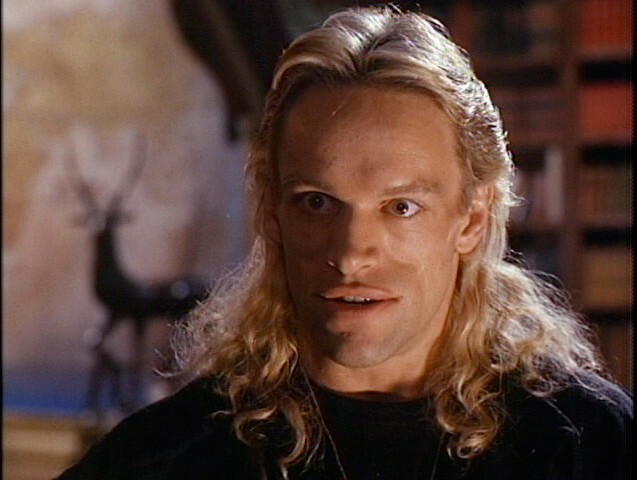 He locked his brother Kabal (Brian Thompson) in space-jail over a century ago for trying to let in the demons. 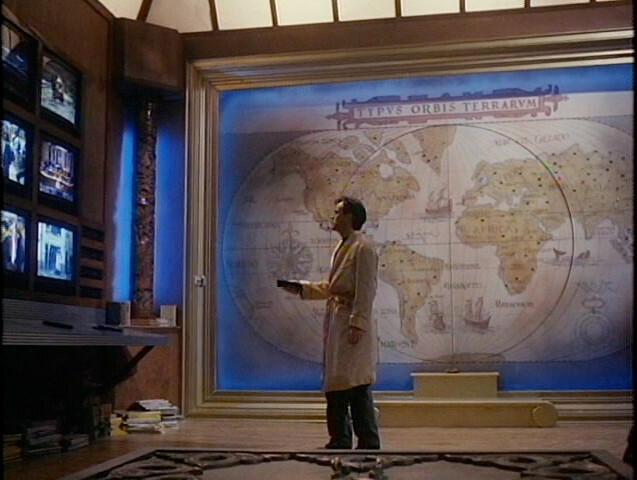 As the movie opens, Monitor informs Mordrid that Kabal has escaped, and Mordrid must venture out of his luxurious apartment to recapture his brother before Kabal can let the demons in. Police consultant on the occult Samantha Hunt (Yvette Nipar) just happens to live on Mordrid’s floor, and the two fall in love over ritual murders and magical shenanigans. Samantha Hunt, trying to make sense out of a detective’s nonsense. There’s a lot going on, and to help keep the budget low some of it is hinted at without being seen. The demon horde is largely represented by a latched portal with noises coming from behind it. The astral plane, where Mordrid consults Monitor, is blackness. Although Mordrid and Kabal’s history is seen in a flashback montage, most of the actual information is provided through voiceover. You don’t get to see a lot of their fighting that led to Kabal’s defeat. It reminds me of the way that Basil Wolverton would give depth to the worlds of Spacehawk , describing the history of and details of places that the hero’s rocket flew over. It works well here, with narration and oblique references in dialog supplying Mordrid with the weight of years spent watching and preparing. Kabal tries to sway Mordrid to the dark side. Also of help is Jeffrey Combs himself. Mostly known as the single-minded Dr. Herbert West in the Re-Animator films, Combs has played a lot of villains in his time. At first glance, he’s an odd choice to be Earth’s defender from evil, but he really sells the serious and socially awkward nature of Mordrid. He’s a character who likes people enough to help them but isn’t quite able to relate. Combs gets that, and he plays Mordrid as being most comfortable when being the Sorceror Supreme. Whoops, that’s Doctor Strange’s title. Probably should use something like Alchemist Absolute. Effects-wise, it’s about what you’d expect from straight to video fare of the early 1990s: some smoke and blood, and drawn-in lights and beams. 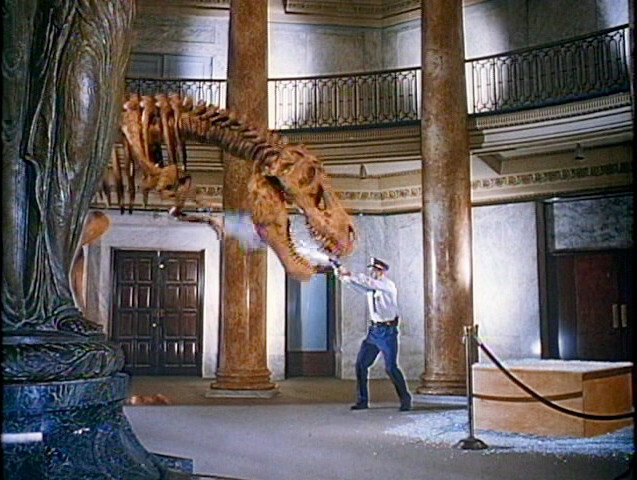 The star of the show is the skeleton fight in a museum. When Mordrid and Kabal finally meet up, the evil brother has brought a dinosaur skeleton to life to keep the guards busy. Mordrid counters with a mastodon, and what follows is a terrific little stop-motion fight scene. This is, after all, a Full Moon production. The one effect they could always pull off was stop-motion, which is why they had so many killer puppet movies. David Allen presumably led the team here, although he’s credited merely as animator. Allen had previously done creditable work on cult movies like Equinox and Q: The Winged Serpent and did the glorious robot fights in Robot Jox for Empire International Pictures (Charles Band’s company just before the many variations on Full Moon). It’s a good low-budget effects pedigree, and Allen delivers the goods with the fight out of time (and skin). Bullets aren’t even going to piss it off. 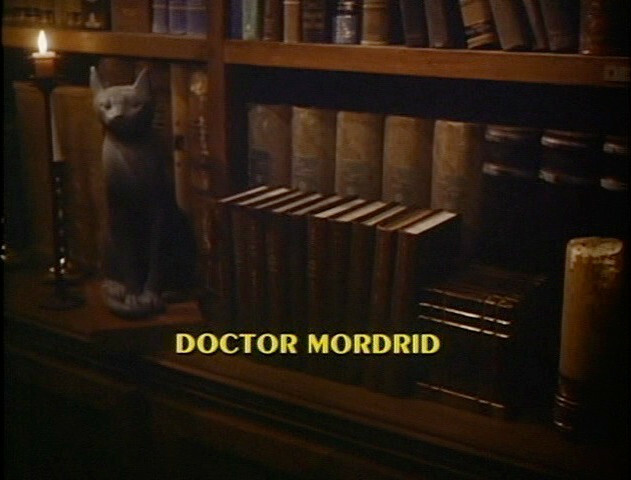 Doctor Mordrid isn’t great filmmaking; it’s great low-budget filmmaking. It’s the sort of thing I’m looking for when I’m watching independent genre films. There’s some cool effects work, a decent story, good acting, and a heck of a lot of imagination. Most of all, it’s just a lot of fun to watch. A lot of films bore me because they try to stretch 20 minutes into 80. This one crammed at least 160 into 74. I’m not used to being that engaged, which is why it left me tired but happy. I need to see this one again-stumbled on it on cable as a kid and remember enjoying it and nothing else. It is like a sundae on top of a cookie drowning in awesome sauce.